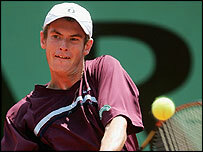 Britain's Andrew Murray has failed in his bid to reach the French Open boys' singles final. The 18-year-old Scot, winner of the boys' US Open title last year, lost 7-5 6-3 to Croatian Marin Cilic. Murray, who spends much of his year training on clay courts similar to those used at Roland Garros, will now have to adapt his game to grass. He has been given a wild-card to compete against some of the world's leading men at Queen's Club next week.